Taco Tuesday! Or Mon, Wed, Thurs, etc… When ever your looking for a lighter Mexican meal, and are tired of chicken or beef this one does the trick! This salmon is seasoned with a delicious herb mixture to make it full of flavor. Grilling it either on the bbq or in a skillet makes cooking time a cinch and the purple cabbage adds great crunch and color. 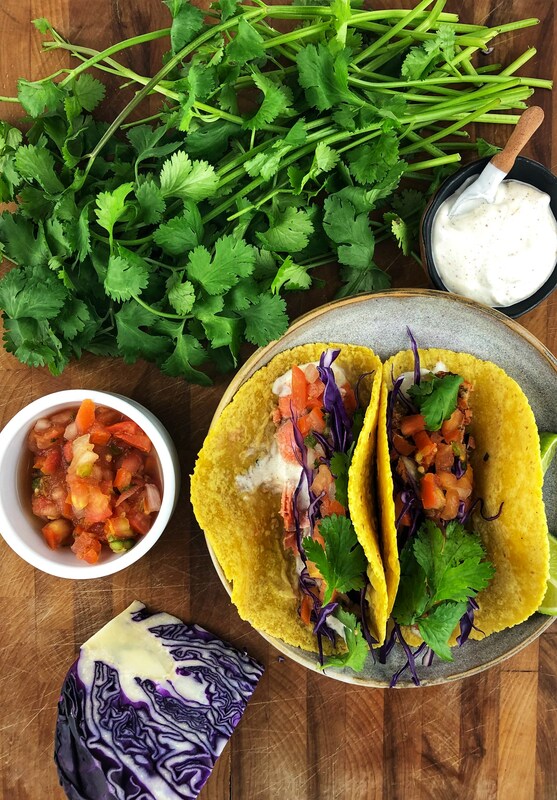 This recipe includes a chipotle sauce that is super creamy and all you have to do is add your favorite salsa, some cilantro and some freshly squeezed lime for an amazing taco night! while your skillet is heating up, quickly remove the salmon from the package and pat dry. once dry sprinkle herb seasoning all over the top of the fish. no need to put the seasoning on the back because you will discard the skin after cooking. unless you prefer to eat the skin, then you can season that side too – this can be made on the bbq also (great in the summer).